First published in 1974, this book provides a helpful overview to the ode. 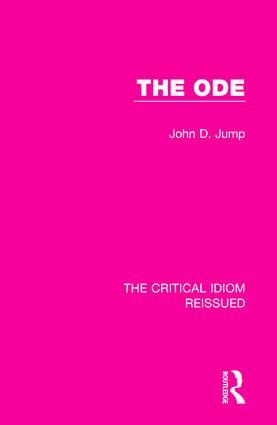 After introducing the reader to classical odes, it goes on to trace the development of two major types: the Pindaric ode and the Horatian ode. The book concludes with a study of odes from the nineteenth and twentieth-centuries. This book will be of particular interest to those studying poetry, verse form and literature more generally.